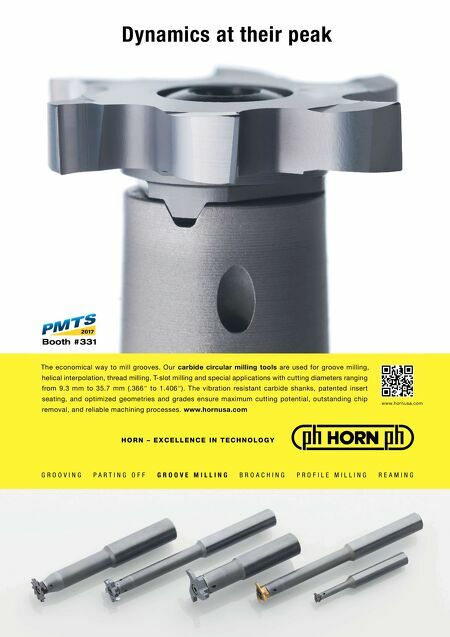 MMSONLINE.COM 10 MMS March 2017 mmsonline.com MMSONLINE.COM Web Extras | mmsonline.com MMS Extra is Modern Machine Shop's free email newsletter. To subscribe, visit mmsonline.com/sub/newsletter. 0 0:27 0 2:0 8 VIDEO: UPDATE ON HYBRID MANUFACTURING In a video filmed at the 2016 Additive Manufactur- ing Conference, Editor-in-Chief Peter Zelinski interviews Greg Hyatt of DMG MORI about the "hybrid" manufacturing concept that combines additive and subtractive operations into one machine. Dr. Hyatt describes the company's process in bringing that concept into a production context, including some of the new applications for the technology the company has been work- ing on. Watch the video at short.mmsonline.com/ hyatt . LOOKING FOR A SUPPLIER? 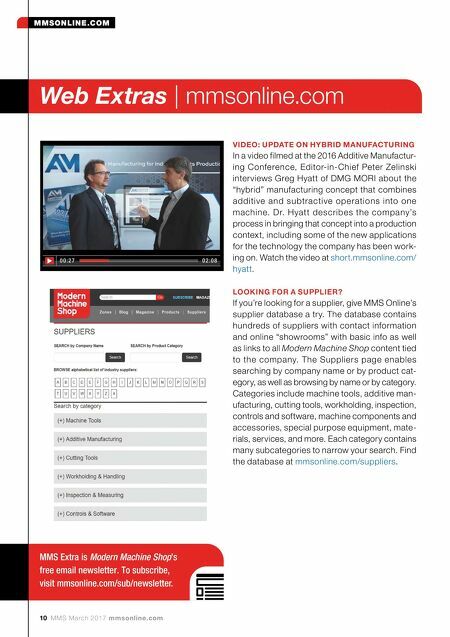 If you're looking for a supplier, give MMS Online's supplier database a try. The database contains hundreds of suppliers with contact information and online "showrooms" with basic info as well as links to all Modern Machine Shop content tied to the company. The Suppliers page enables searching by company name or by product cat- egory, as well as browsing by name or by category. Categories include machine tools, additive man- ufacturing, cutting tools, workholding, inspection, controls and software, machine components and accessories, special purpose equipment, mate- rials, services, and more. Each category contains many subcategories to narrow your search. Find the database at mmsonline.com/suppliers .